Roads? Where we're going, we don't need roads. 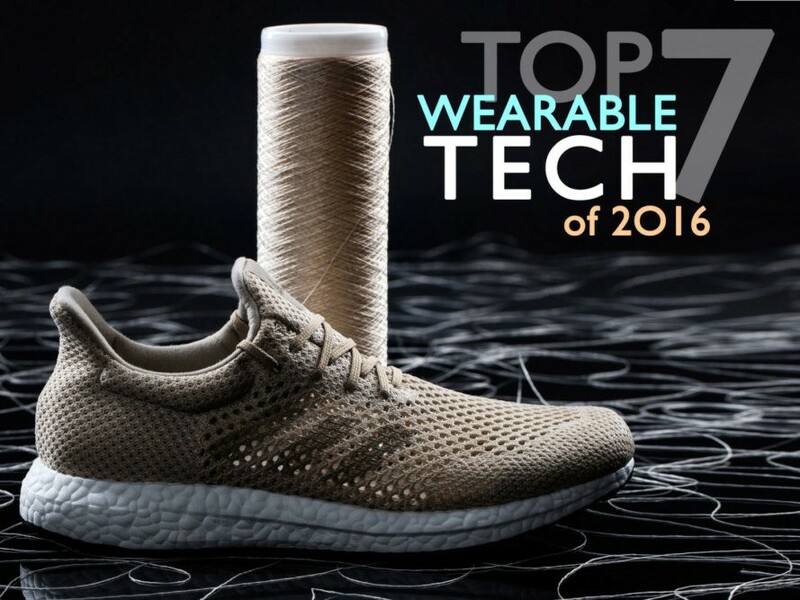 From a breakthrough in three-dimensional printing that could revolutionize the way we create and consume clothing to squid-inspired fabrics that not only repair themselves but also protect their wearer from chemical attacks, here are the year's most innovative examples of wearable technology. Above, a sneaker from Adidas that boasts an upper made with 100 percent biodegradable—and cruelty-free–synthetic spider silk. Researchers at Pennsylvania State University have developed a way for fabrics to repair themselves with just a little pressure and warm water. The secret lies in a biodegradable liquid, which can be applied to conventional textiles such as cotton, wool, and polyester as a multilayered coating. Derived from a mix of bacteria and yeast, the as-yet-unnamed liquid shares similarities with a protein found in squid tentacles, specifically the rings of sharp teeth that line their suction cups. The robotic revolution isn’t coming; it’s already here. For that you can thank—or blame—Sewbo, a Seattle-based startup that claims to have created the first industrial machine to sew a complete garment—a T-shirt, to be more precise. This watershed moment, according to the company, represents the “first time that a robot has been used to sew an entire article of clothing.” There’s a reason why automatic clothing production has never gone beyond a few computer-controlled cutting machines. Despite advances in manufacturing technology, mechanical arms have trouble grasping textiles, which lack the uniform integrity of, say, sheet metal. Sewbo sidesteps the problem by temporarily stiffening fabrics using a nontoxic, water-soluble polymer. An incredible new “face lift in a tube” could dramatically reshape the appearance of eye bags and wrinkles without surgery. Developed by scientists at the Massachusetts Institute of Technology, Massachusetts General Hospital, Living Proof, and Olivo Labs, the second-skin-like material comprises a network of cross-linked polymers that mimics the appearance, strength, and elasticity of healthy epidermis. But bolstering sagging jowls isn’t the only thing the wearable film, dubbed XPL, is good for. With further development, researchers say that it can deliver drugs to help treat skin conditions such as eczema, psoriasis, and dermatitis. Imagine a future where working up a sweat not only does your body good, but it’ll also keep your favorite devices humming. That’s the goal of researchers at North Carolina State University,, where Daryoosh Vashaee and his team have developed a way to harvest body heat and turn it into electricity. Although similar technologies have been around for years, NC State said that its prototypes are lightweight, flexes to the body, and generate “far more” electricity than their predecessors. "Power dressing” no longer means what you think it means. Scientists at the Georgia Institute of Technology have developed a fabric that will not only keep you clothed but will also glean electricity from sunlight and movement—simultaneously. “This hybrid power textile presents a novel solution to charging devices in the field from something as simple as the wind blowing on a sunny day,” said engineering professor Zhong Lin Wang of his research. The term “fast fashion” is poised to take on a whole new meaning, thanks to a breakthrough in three-dimensional printing that could revolutionize the way clothing and shoes are made. Researchers at Loughborough University in London, in collaboration with Thailand’s Yeh Group and an unnamed “major fashion house,” are embarking on an 18-month project to create customized garments in under 24 hours.